The show in Nottingham followed a short run of shows in Europe and marked the start of the band's first UK tour in a couple of years. After seeing them seven times in just under a year from 2016 to 2017 it has been a long wait - and I am so glad that they are back playing live and with lots of brilliant new music in tow. Soundtracking my review writing is the band's new album So that you might hear me - it's not released until 26th April but I've been treated to an early stream - I'll be posting a review soon but I can promise fans that it is a gorgeous record and you're going to adore it. Opening the night was Tusks, AKA Londoner Emily Underhill. I have a lot of respect for an artist (particularly the opening act) who can bring a crowd to near silence with just an electric guitar for company on stage (she usually has the backing of a four-piece band, but joked to the crowd about having run out of money to pay them after the European dates of the tour.) I went to the show armed only with the knowledge of the support act's name, so had no idea what to expect and was - as I think the 2000 strong crowd were too - watching in quiet admiration for the duration of her set. A personal highlight was a stunningly understated cover of London Thunder by Foals which I've shared below. 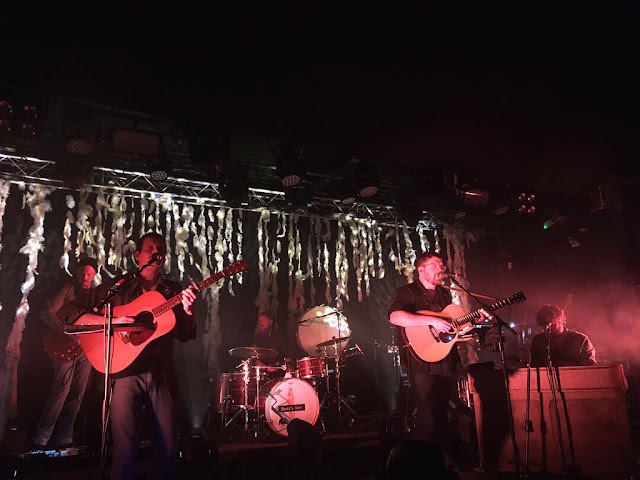 Once Tusks' set finished, the stage was readied for Bear's Den, with an almost immeasurable number of guitars both on and off the stage, and a beautiful backdrop made from hundreds of feathers, paying homage to the artwork for the new record. 9pm arrived and the lights went down (ten points for perfect timekeeping) and the anticipation in the room became quickly apparent, it's safe to say Nottingham had missed them. The band took to the stage, a six-piece live ensemble, and opened the set with Fuel On The Fire, the first taste of the new record which they dropped back in January. Consider the bar set for the rest of the evening. As well as Fuel On The Fire and Blankets Of Sorrow the band played four more tracks from the new record - recent single Laurel Wreath and unreleased tracks Fossils, Crow and my personal favourite from the new record, Hiding Bottles (at the moment I'm adoring the lyric "yeah I'm keeping it together but you don't know the half of it, it's starting to show, no I'm not on top of this.") The new tracks were received superbly, but the crowd was probably most excited for an impromptu cover of (the chorus of) Nelly Furtado's I'm Like A Bird, which was as simultaneously crazy and wonderful as it sounds. That'll teach Davie not to joke on stage about being so rock and roll that they'd been singing her songs backstage - cue the entire crowd yelling at them to play it - "you've gotta sing along otherwise we're fucked [...] I can't believe this is happening." So well loved are the band that it felt as if the majority of tracks they played were fan favourites, each receiving cheers of excitement from the very first notes. Testament to just how many brilliant songs they have, my personal favourite Magdalene is sadly not on the setlist at the moment, but I think I can forgive them. Bringing out the electric guitars and synths from the second record, the likes of Auld Wives, Emeralds and title track Red Earth & Pouring Rain received a rapturous welcome and got the crowd singing along, but nowhere are the audience louder (I think) at a Bear's Den show than during first album track Isaac. The track features the lyric "I'm gonna give all my love to you" - it was lovely to see how happy, and in a way shocked, the guys were to hear the crowd singing this back to them so loudly at this point - I love a band that doesn't take that level of fan interaction for granted! A huge highlight of the set for me was another first album track, When You Break, which contrasted enormously with the unplugged segments of the show as the band descend into a jamming, drum-pounding and strobe-light infused outro which left me in a complete state of amazement. This level of variety in between tracks is one of the things that makes a Bear's Den show so exciting. As the show neared its end, Above The Clouds of Pompeii and closing track Agape, both from the first album, offered the crowd a last opportunity to exercise their lungs and show some love for the band - and they did! 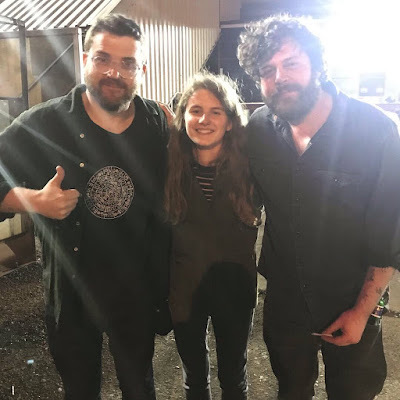 As you've probably guessed, I loved the show and I really really love this band. A few dates are sold out, but they have a few UK shows still to come, including two nights at O2 Shepherd's Bush Empire, followed by a US tour in May and June - all the dates and ticket info are here - I hugely recommend getting along to a show if you can. I'm really excited for what the year has in store for the band, they're on the cusp of releasing a brilliant record and deserve every ounce of success it brings - from previous shows and chatting to them after the gig on Tuesday I can attest to Davie and Kev being two of the sweetest, kindhearted and humble people I've had the joy of meeting and my heart is currently swelling with pride for them. Now: buy a ticket and pre-order the incredible new record So that you might hear me here, you can thank me later. Follow Bear's Den - Facebook | Twitter | Instagram. Follow Tusks - Facebook | Twitter | Instagram.